Welcome warmth and brightness into your home with the addition of skylights. Straight Line Roofing & Siding is a local home improvement company that specializes in the installation of skylights throughout Central Maine. We offer quality products from industry leader, CertainTeed, and back them up with our years of experience and pride in our craft. If you're interested in 'going green,' skylights have a lot to offer. Energy saving benefits are available with the latest Energy Star® technology, while maximum efficiency decreases the need for expensive artificial lighting. If you'd like to discuss adding skylights to your home, contact us at 207-786-4414 or fill out our online contact form. 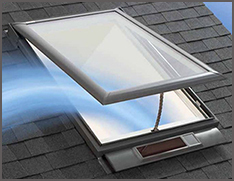 We'd be happy to discuss how to get the most out of your skylight addition.